After a week of monitoring, planning and preparation, state, county and federal government leaders and civil defense officials are strongly urging residents and visitors throughout the Hawaiian Islands to brace for the full onset of Tropical Storm Olivia, starting late tonight. As of 8:00 p.m. HST, Olivia had maximum sustained winds of 50 miles per hour and is moving in a southwest direction at 8 miles per hour, according to the Central Pacific Hurricane Center. Olivia’s center was located 85 miles north-northeast of Hilo on the island of Hawaii, 105 miles east of Hana on Maui, and 230 miles east of Honolulu on Oahu. The center of Olivia is forecast to pass over Maui County and the northern part of the island of Hawaii, but the storm’s severe weather effects could extend statewide. Adding to the danger of Olivia is its erratic, unpredictable behavior these past 24 hours, with the storm weakening, then gathering strength, before steadily weakening and unexpectedly changing the course of its projected direction. George D. Szigeti, president and CEO of the Hawaii Tourism Authority, advised, “Don’t be complacent about Olivia or make any assumptions about its status without hearing from informed weather experts and meteorologists. The National Weather Service has stated Olivia’s high winds could go on for many hours and that rainfall could come in several waves, adding to the dangers of structures being destroyed, landslides and flash flooding. All islands statewide are susceptible to high winds, heavy rainfall, flash flooding, hazardous surf conditions and coastal storm surge due to Olivia. The northeast and east shores of all islands, especially Maui County, will experience Olivia’s initial impacts. Potential rainfall of 5 to 10 inches is expected statewide, with isolated areas possibly receiving up to 15 inches. 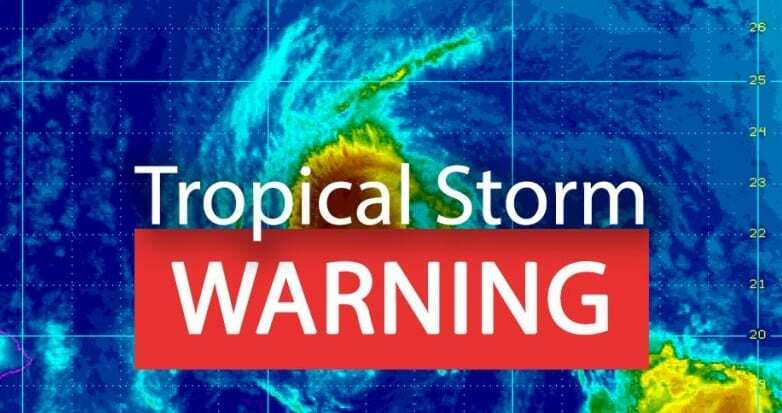 All of the Hawaiian Islands are under a tropical storm warning, meaning sustained winds within the range of 39 to 73 miles per hour should be anticipated. All islands are also under a flash flood watch through Thursday, meaning conditions are favorable for flash flooding in flood-prone areas. Residents and visitors are strongly encouraged to have access to an adequate supply of food, water, medications and essential goods and plan to shelter in place until Olivia has completed its pass of the Hawaiian Islands.